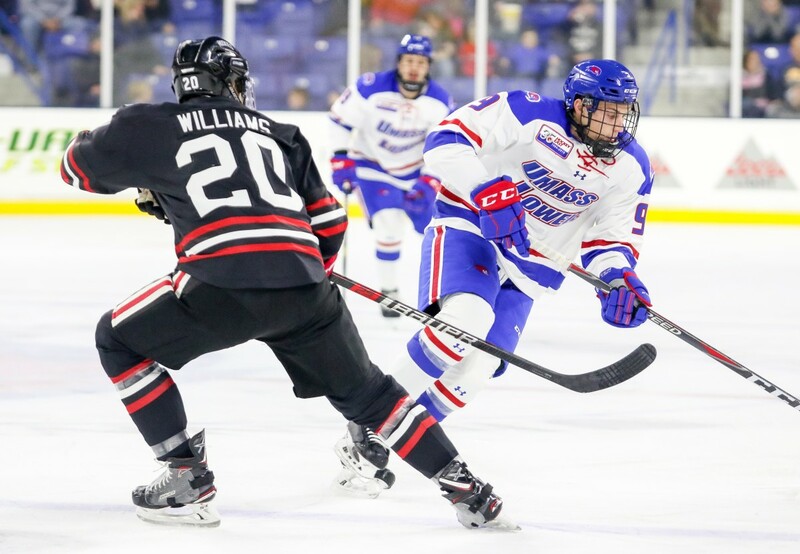 The UMass Lowell River Hawks put the Tsongas Center to sleep with an uninspiring effort against the Northeastern Huskies on Friday, Oct. 26. After 60 minutes of mostly uneven play on the part of UMass Lowell, their first Hockey East matchup of the year ended in a bitter 4-1 loss that only a fraction of the crowd remained to see to its dying second. Besides some flashy plays and an electrifying goal from sophomore forward Connor Sodergren midway through the third period, the River Hawks were a nonfactor against the Huskies. Sodergren’s goal, which bounced up and behind the pads of standout Northeastern sophomore goaltender Cayden Primeau, imbued a brief sense of life and enjoyment into the crowd at the Tsongas Center. 26 seconds later, the audience would fall silent again as Northeastern packed away a top shelf goal over the shoulder of River Hawks’ junior goaltender Tyler Wall. Just as quickly as life and fire had come, it was lost. The River Hawks then dawdled around the neutral zone, tailing the Huskies more than playing against them. UMass Lowell was outplayed by Northeastern’s defensive savvy and aggressive offensive pressure throughout the first and second periods. Where UMass Lowell dallied, Northeastern attacked. Where the River Hawks passed, the Huskies shot. The second period was emblematic of the River Hawks’ offensive and defensive woes. During a sequence late in the period where the River Hawks were awarded two straight power plays on a gilded platter, the River Hawks hesitated where they should have struck. They allowed Northeastern to clear the puck several times and even had a shorthanded chance. Wall was the River Hawks’ saving grace. Coming off a solid junior year start that now stands at 2-2, Wall kept his head among immense pressure from Northeastern attacks. He made 23 saves behind a team that did little to help him. Bazin spoke warmly of Wall’s effort, calling it one of the “positives” of the night. Beyond that, however, there was much that the River Hawks needed to improve. Northeastern’s senior forward Patrick Schule opened the scoring at 6:54 in the first period with a sneaky wraparound goal that just eked behind Wall. The defense around Wall did not make an impact throughout the night, and they certainly did little to make themselves known threats to Northeastern’s offense on that goal. Much of the first period consisted of back and forth play between UMass Lowell and Northeastern. Although UMass Lowell gained higher possession times as the period went on, they had a difficult time keeping the puck away from the Huskies’ clever stickwork. Perhaps what might have stung the most in messy game by the River Hawks was how quickly they gave up after Northeastern’s third goal. Northeastern’s final goal, an empty netter scored with just under three minutes remaining in regulation, signaled the end of the game for not only the dejected fanbase but for the team. The numbers and individual results of a hockey game hardly mean anything. Hockey is a game of constant chances, wherein bounces can go one way or another. An individual loss, especially one that comes so early in the season, is a nonfactor at the end of the season. UMass Lowell will travel to Bentley for a Saturday night nonconference matchup, and Bazin hopes to see an improvement over the previous night’s effort. Puck drop in Waltham, Mass. is scheduled for 7 p.m. After playing a Hockey East doubleheader at Maine, the River Hawks will return to Lowell for yet another conference matchup against the University of New Hampshire on Friday, Nov. 9 at 7:15 p.m.